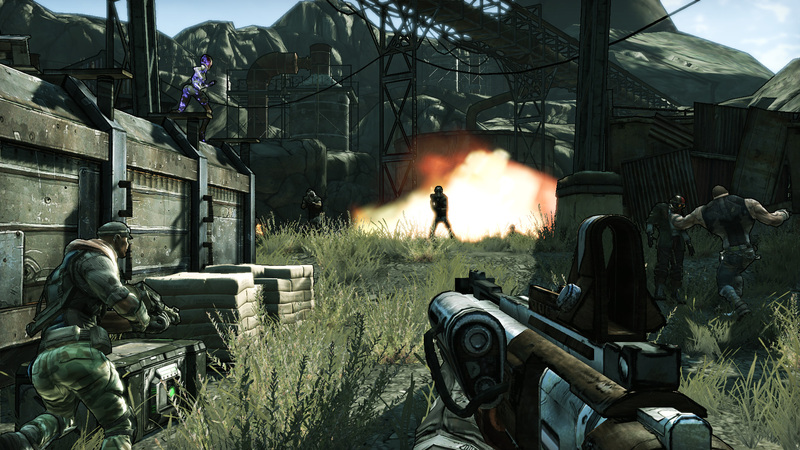 From great advertising to a unconventional art style, Borderlands is that first person shooter with a loot system like Diablo that you might have been waiting for. 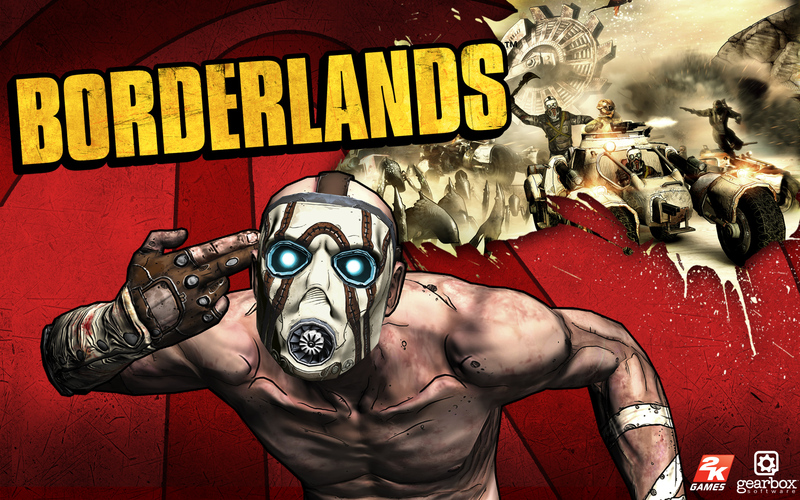 Borderlands carries a weak story setup by a bus ride into the desert, once there you and your crew are out to find the elusive Vault. This vault is fabled to carry untold riches and unrivaled alien technology. Then starts the first person goodness. To start out you have four classes to pick from. Each has their own specialty and special ability. One of the nice things about this game is you can level up any gun skill, you are not limited to your gun proficiency you start with. So if you pick up a gun you really like, just use it, your XP will come. There is a soldier class that starts with proficiency machine guns and shotguns, special ability: deployable turret. 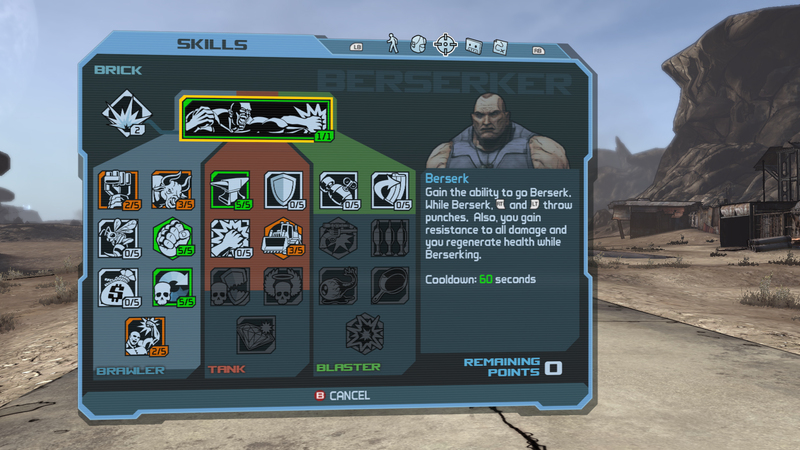 There is a berserker who is melee and heavy weapons, special ability: beserker rage. There is a hunter who is snipers rifles and revolvers, special abilities: Pet Bird. There is siren who is shotguns and handguns: phasewalking. Each of these classes has their own tech tree which they can level up to help themselves, others, or enhance the group. Each one offers plenty of benefits. Oh and I forgot to mention, it is multiplayer! The game follows the basic MMO/Diablo style talent tree system. As you level up you get points to add to various skills and abilities. These skill and abilities either modify your weapons our your special abilities. These are what make you powerful. Along with the MMO influence is the loot system. Each gun has unique stats and are generated on the fly. There are set piece weapons you get off of bosses, however world loot is dynamically driven, the hard the the enemy the odds of better loot. If you play it multiplayer, the enemies levels are enhanced and in like some of these games, only the best loot can be found in multiplayer. Now on to the multiplayer, it offers four person online or two player split screen co-op. There is a caveat to the multiplayer, loot is first come, first served. There is no loot priority system, so make sure you play with people you know or can trust. That way loot can be shared. Despite having RPG core elements, this is a FPS and as a FPS it works well. The guns all feel well, the focus and aim of guns work well. The destruction you can implement also work well. My favorites ended up being shotguns, some of the SMG’s, and the sniper rifle. There is also a few third-person vehicle events. You can use the vehicles to travel, when one is not around, expect lots of running at the start of the game. The vehicles feel good, the controls do take a little while to get used to, the best I could come up with was the warthog from Halo. One stick is gas, the other changes the camera view and that is the direction you try to go. There are two types of armament for your vehicle, rockets or machine guns. I used the rockets primarily. Your inventory is limited, so do not try to carry and loot everything you see. Eventually you will get back pack upgrade slots found from rescuing various clap traps out in the world. Clap traps are the R2D2 like robot that greets you in the first town, entertaining at first, annoying later. I dont want to hear “Check me out I’m dancing!” ever again. hehe. Mission structure is standard fair, there are side missions in every area, go kill X of these guys, or go collect this or that. Then there are main story line pieces. These sometimes are unable to be identified. During the first play through, I out leveled content by doing all of the side missions. So at the end, the game offered minimal challenge. There is the chance for multiple play throughs, so the monsters to start to scale on the second play through. Be warned, there is lots of running for the first few hours of the game. Until you unlock the quick travel systems, you will spend lots of time running. If you look for enemies to kill while running, that is another way you will out level content. There are some boss fights, and due to the fact that you can out level content, I was a bit depressed when one of the set piece boss fights, shown back before the art style change over occurred, was easily over come due to my level. The game looks gorgeous and barely suffers from any frame rate issues. Although they offer you a compass on the bottom of the screen with way point markers for missions, you will constantly be referring to the big screen map. I really would have liked to see some form mini-map on screen to help with many of the navigation issues presented. The presentation of bosses is something fun, when you meet the first boss, I dare you not to at least chuckle when he is presented. The art-style really adds to the game. I believe it might be one of the things that really helped lead to the mass appeal of the game. This was not a MW2 clone or realistic graphic tour’de’force, it is fun sort of cartoony adventure with lots of bullets sprayed. Currently there are two DLC packs out for the game. The Island of Dr. Ned, which is trying to capitalize on the zombie craze going on. The second is a tournament style system with a Mad Max style title, Mad Moxxi’s Underdome Riot. I just picked both of these up this weekend and plan on giving them a whirl once I finish up Mass Effect 2. Leveling Up – Everyone can use everything, despite starting class, so no need to toss weapons you like. Presentation – It looks nice and fits the nature of the game. Sense of humor – The game has a darker sense of humor that makes it fun, some of the people in the world are exactly what they are, characters. Loot – Did I mention this is a game built around loot. There is lots of it, and juggling stats is one of the most enjoyable aspects of the game. Fast Travel – When you unlock fast travel, life becomes so much simpler. Re-spec System – You can change your tech tree for a small amount of coin. This is beneficial when playing with others or solo. Hope you brought good shoes – there is a lot of running in the middle of no where. This is relieved somewhat by fast travel later on. Claptrap – Why? Oh Why? Can’t I shoot him when he wants me to check him out. I do like him, sometimes you just want to shut him up. Level Scaling – You can out level content your first play through, making encounters trivial. Lack of enemies – There are only about 5 different enemies, all of which, over the course of a play through, become predictable. This review was based on a retail copy of the XBOX 360 version of the game, purchased by the reviewer. It is available on XBOX 360, PS3, and PC.